The Class of 2010 made their connection. We are awaiting our boarding call for the Transatlantic leg of the journey home. Beautiful weather in Germany. I must say, the Swiss Alps were spectacular from 20,000 feet. Visibility was unusually crisp and clear. All are well. The boys are all at Florence airport, through ticketing and security, waiting at the gate. Perfect weather for flying. Departure from Hotel Kraft was drama free. Some are playing Scopa, a fun Italian card game I taught them earlier in the trip, others are eating, relaxing. Flight is on time. Faculty, ever vigilant, are starting to show soft signs of exhaustion, or is it more the beginning signs of relief. Either way, they are on the final leg of an incredibly successful trip. Our last day in Firenze! Weather wise, it was another perfect day. Sunny. The morning was spent admiring the Brancacci Chapel and the incredible work of Massacio, Filippo Lippi and Masolino. Highlights included the fresco cycle of the Life of St. Peter, The Expulsion and the Tribute Money. We stayed Oltrarno—it’s nice south of the Arno—next visiting Santo Spirito, just west of Pitti Palace and about a half mile south of the outer Roman wall, Porta Romana, of the old city. Lunch today was at Palazzo Capponi. Mr. Ferragamo gave the boys a warm welcome to his and Chiara’s home, and told the story of the difficult but important restoration of the palazzo and the Nazi bombing of the Ponte Trinita, adjacent to the palazzo. The boys were enthralled by this story. We then enjoyed a guided tour of the grand ballroom frescoed from floor to ceiling by Poccetti in the late 1500s/early 1600s depicting the history of the Capponi family. A delicious lunch followed before the boys left to make their way across the “new Ponte Trivita” to the Baptistery to view the South (Pisano, 1333, stories of St. John the Baptist) and North doors (Ghirbert’s first, 1424, stories from the New Testament). Our final visit of the Italian Study Tour was the Uffizi. Final festivities have just concluded at Hotel Kraft. The boy’s have had their last meal together. Tommy R. led the boys in celebration of their experience. It was a fun night for all. ... as guests of the Ferragamo family viewing the absolutely spectacular Capponi ballroom depicting in frescos by Poccetti, the story of this important family in the Florentine history of the late Renaissance. Massimo and Chiara then treated the boys to lunch at the Palazzo. 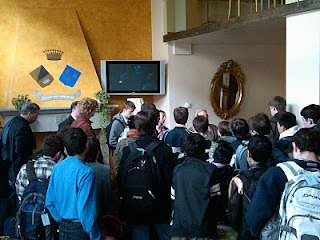 ... at Hotel Kraft before leaving for Brancacci Chapel 8:30 AM, Wednesday. Another sunny day! It’s the day before St. Patrick’s Day, not that I’m counting. Absolutely beautiful day in Firenze, again! For about five minutes, in the early afternoon as we were all sitting in the Piazza Della Signoria enjoying the sunshine, a few clouds interrupted our otherwise perfect day. We actually thought it might rain. How dare it! But it didn’t. The weather gods were with us. After Chapel in the Lobby of Hotel Kraft, it was off on a visit to San Marco to explore the incredible life of the crazy monk Savonarola, and the incredible work of Fra Angelico. The small, sparse, but beautifully frescoed cells, the cloister, and the story of Savonarola who was eventually burned alive in Piazza Della Signoria, where we would soon enjoy lunch, captivated the boys’ imaginations. The boys were also struck by the glistening wings of the Archangel Gabrielle in Fra Angelico's Annunciation, Ghirlandaio's Last Supper, and the frescoed cell of the Kiss of Judas; which, ironically, is the cell outside which Savonarola was arrested. Following the Dominican Convent, it was a quick walk to the Bargello where we, among other things, viewed and sketched in situ the final two of our four Davids—Verrocchio’s and Donatello’s. Donatello’s was the earliest sculpted, 1430; then Verrochio's, Michelangelo's, and finally Bernini’s, Baroque, mid 1600s. Two are bronze and two marble. They are all spectacular. Several excited parents joined the group for the morning. It was fun for the boys to hear a little from home. Unfortunately, some luggage was lost en route; however it has all been recovered. Things have settled. The day ended with Sports at Le Cascine. Highlights included a soccer and football game where, when Coach Morales made the call to end the games, both a touchdown and a goal were scored in the waning seconds—an exciting outcome! Lights out in a few minutes. All are healthy. 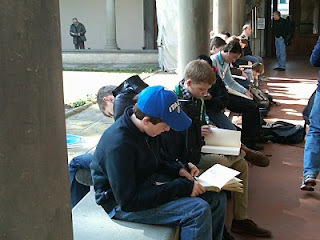 Sketching in the cloister of San Marco on another sun-filled Florentine day 10:30 AM. Gelato by the Cathedral. Does it get any better? 10:45 PM. ... as we walk east for gelato, 10 PM. Another beautiful day in Firenze! After a hot breakfast the boys moved apace to view Lorenzo Ghirberti’s Baptistery Doors—he spent 50 years of his life working on them; Vasari’s inner dome ceiling frescos; Dominico Michelino’s Dante; Luca Della Robbia’s Le Cantorie as well as Donatello’s; Giotto’s, Pisano’s and Della Robbia’s Lower Registry Reliefs—representing all of human activity known at the time; Michelangelo’s Pieta, completed some 50 years after The David, can you imagine; Donatello's Mary Magdalene--which I find very disturbing; the Clock of the Cathedral, found high up on the inner facade—the only clock in the world to tell Italian time (it moves backwards, by the way); the Santa Maria del Fiore’s interior, and The Museo Di Santa Maria Del Fiore. Lunch and shopping with a taste of independence in San Lorenzo Market consumed the middle part of the day. The eyes of the market traders lit up when we arrived and the boys definitely didn’t let them down. We ended the shopping extravaganza with quite an interesting assortment of leather goods, jackets, “faulexs,” matching red shoes and belts, sun glasses, and oh … did I mention, fluorescent ties! After lunch and shopping, we visited Brunelleschi’s San Lorenzo to sketch and view the architecture and Donatello’s pulpits. Then, it was off to sports until the sun managed to lay down behind the Tuscan hills. Our four “less then 100% boys” are all feeling much, much better. No other signs of illness. For me, Della Robbia’s choir stalls are just magnificent. They represent the first real exploration of human life observed in its earliest phases. We see now in this Renaissance work, an interest in childhood, especially the religious and social education of children, and Della Robbia expresses this with joy—singing, dancing, music and fun! Dinner is over and we are heading out for gelato—a surprise. 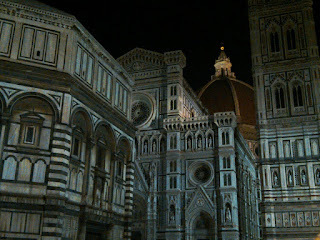 We’ll walk up the Arno under lights to the Ponte Vecchio and then across to see Del Duomo illuminated. 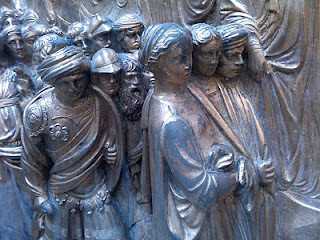 The slide show includes a few detail shots of Della Robbia's Le Cantorie and Donatello's Mary M.
Detail of the Ghiberti's Battle of Gerico studied by the boys today. Here, the people being led by Joshua to the Promised Land. 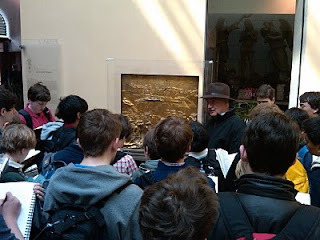 Ignazio explaining Ghiberti's 1454 Gates of Paradise, in this case The Battle of Gerico. Sunny day. The boys woke a little later on this beautiful Sunday morning. The sun was bright, the air cool—a perfect Florentine day. Mass at Ognissanti by the Arno, then off to Santa Maria Novella to view Alberti’s spectacular facade. Italian mass was a treat albeit a little long. Guest lecturer Ralph Harvard explained that the last volute on the façade of Santa Maria Novella was not completed until the 20th century, leaving the façade lopsided for more than 500 years. 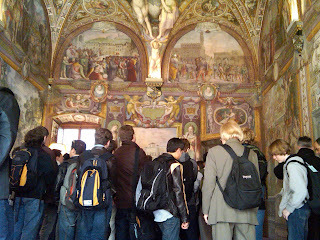 Inside it was Masaccio’s Holy Trinity, Giotto’s seventeen-foot-tall 13th century Crucifix and Donatello’s wooded crucifix that caught the attention of the boys. We then moved in behind the altar to the Tornabuoni Chapel to view, in situ, the incredible Ghirlandaio frescos depicting the life of Mary and the life of John the Baptist. Lunch was outdoors in Piazza della Signoria at Lorenzaccio. After pizza and pasta it was a math lab problem and sketching. Using a few instruments, the boys had to determine the height of Giotto’s Tower, the Campanile. Upon completion, we began the steep climb up 414 steps to the top of the Campanile for one of the most memorable views in Florence. Mr. Imbelli did make it to the top, despite any and all stories to the contrary. Coaches Morales and Murphy cruised to the top with ease, while the remaining faculty kept an eye on the bags and waved enthusiastically. Four boys exhibited symptoms of upper respiratory infection—no strep; all have been treated and at this writing, feel better. Others are all healthy. Everyone is happy. Big day. Dinner now. ... no, just a day in the park, pirouetting, Imbelli style! The boys' Saturday in Florence can be summed up with just two names: Dante and Michelangelo. Led by our Florentine guide, Ignazio, we departed the Kraft around 9:30 after a hearty breakfast, and walked east across the center of Florence to the Accademia and Casa Buonarroti, Michelangelo’s “home.” En route the boys passed the Baptistery and Duomo, Piazza Repubblica and Via Roma—all roads lead to Rome, or in the case of Via Roma, from Rome. Casa Buonarroti was our next stop—three adjacent houses joined—just like Saint David’s! Two pieces that define the Casa collection: the low relief sculpture, Madonna della Scala (of the stairs), and Battle of the Centaurs—both completed by Michelangelo in his teens—were the focus of our visit. The first depicts Michelangelo’s study of Donatello, and the second his love of classical art. 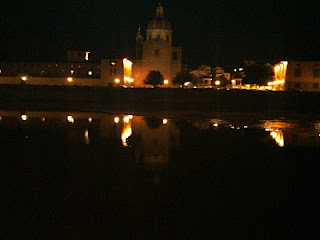 The boys also sketched at Casa, choosing between the wooden model façade of San Lorenzo or the River God. Lunch was at Finisterrae, the end of the Earth—unusual name, great food! Being now content with stomachs full, and having just visited Michelangelo’s home, we moved on to his tomb. Before entering the Franciscan Santa Croce, the boys heard a little from Ignazio on Dante while standing under his statue in the Piazza. After exploring the tombs of Michelangelo, Galileo, and Machiavelli within the walls of Santa Croce, we moved outside to the Pazzi Chapel where the Chamber Singers performed a Gregorian chant—a highlight of the day. The magnificent sound resonated throughout the sacred space transporting all those listening back to another time. Incredible! Following a quick change, the boys were off to sports. Football, soccer, catch and relaxing in the park on a picture perfect day defined the late afternoon. All are healthy and happy. Camaraderie is high. On Machiavelli’s tomb are etched the words "TANTO NOMINI NULLUM PAR ELOGIUM." Loosely translated it says: For such a name there are no sufficient words of praise. I think for many of the boys, these words could easily be used when describing their Italian Study Tour. The day started with an early rise in Rome at 6 AM. The boys boarded the bus and said arrivederci, Roma. Journals are coming along. 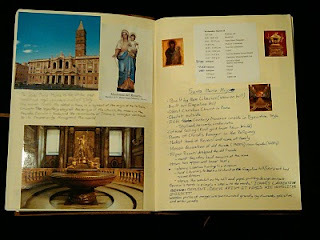 The photo included is of a few pages from one boy’s journal. It is easy to see why Francis is a special saint to Saint David’s. All are healthy and happy. Believe it or not, but we just did a bed check and all the boys were under the covers—they are either incredibly good actors or they are all dead tired. ... the sun is trying to break through the Roman clouds this morning as all woke early for a solid day of touring. The group, after breakfast, made their way to Villa Borghese, one of the highlights being Gian Lorenzo Bernini's David--obviously important to us at Saint David's. This afternoon it's lunch, St. Peter's Square and a private tour of the Vatican and Sistine Chapel tonight. The boys whose passports were stolen were all issued new ones this morning at the American Consulate and the travelers checks are being issued as I write this blog entry at 2:50 PM Rome time. All remain healthy. ... was a little cold for the group's first few days of exploration. 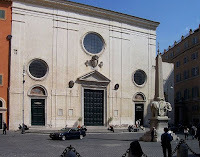 A visit to San Luigi dei Francesi designed by Giacomo della Porta and built between 1518 and 1589 was followed by an extended lunch in the beautiful and famous square, Piazza Navona, which is right near-by, where the boys admired masterpieces by Bernini, della Porta, and Borromini. After lunch and some sketching, the boys visited the only Gothic church in Rome, the Basilica Santa Maria sopra Minerva. The church is so named because it was built directly on the foundations of a temple to Minerva, the Roman goddess of wisdom, built by Pompey c. 50 BC. The basilica that stands today was begun in 1280. Gelato finished off the afternoon before the group headed back to the hotel. For the first meal in Rome, all sang happy birthday to Brad D. and almost everyone managed to stay awake during the three course meal--a record, almost, in and of itself--a long, but exciting day was had by all. At the Colosseum, Flavian Amphitheatre, on day two, after hearing Coach Morales' incredible history of sports lecture, the group realized they'd been "robbed." A few passports and travelers checks were stolen. Everything, though, is under control. Families affected have all been contacted. Checks and passports are being replaced. All are healthy and in great spirits. Ah, the excitement of Rome! Photos are from the public domain. After a late afternoon departure from JFK on Monday, eighth graders and their teachers arrived safely in Rome this morning. Once luggage was deposited at their hotel, the boys immediately began their exploration of Rome with a visit to the Pantheon. Light, freezing rain began to fall. Spirits though, are sunny. An important component of the ongoing Curriculum Initiative at Saint David's involves the Athletic program. One aspect of this initiative includes the professional development of coaches. Due to an incredibly generous donation this past month from an anonymous donor in memory of long-time Saint David's friend, alumni grandfather, and patron Albert H. Gordon, the school's ability to fast-track its scheduled implementation of new goals and objectives has increased excitement and momentum within the department. This past February 25th through 27th, for example, coaches Jeremy Donohue and Jorge Roman attended the three-day Soccer Champions Coaches Clinic at Uncasville, CT. The primary goal in attending this workshop was to attain the Coaching “E” Certification. The curriculum focused on the development of the player, both individually and as part of the team. According to Coach Roman, "Overall, the “E” Certificate Course further developed our coaching and soccer skills associated with coaching players ages 9-12 years by increasing knowledge and understanding of the technical and tactical demands of the game of soccer." The classes also provided an understanding of practical coaching methodology and foundation necessary to prepare players and teams for competition. ... extensively this week. Fourth Grade boys took us on a journey with them along the Silk Road (the Headmaster's Office was Rome) and the Second Grade to the founding generation--revolutionary Americans. Extending for more than 7,000 miles, the ancient trade routes that comprised "the Silk Road" (200 BC through 200 AD approx.) enabled people to transport goods such as silk, satin, musk, spices, medicines, jewels, and glassware, as well as serving as a conduit for the spread of knowledge, ideas, and cultures between different parts of the world--Ancient China, Ancient India, Asia Minor and the Mediterranean--contributing to the development of the great civilizations of China, Egypt, Rome, Persia and India, to name a few. The boys moved along Saint David's "Silk Road" trading and exchanging throughout with equal daring and influence. The halls and stairwells were aglow with color, movement and noisy "trade." In the Wax Museums of the Pi, Theta and Chi classrooms on Thursday, Madame Tussauds would have been proud. The Second Graders, before the coin was dropped in the slot, were as frozen as any wax figure on 42nd Street. Once engaged though, they came alive and spoke convincingly of their rightful place in the founding history of America. Incredible job! They were so very serious--wigs and all. In both cases the boys were physically engaging, through role-play, with history, bringing to life their studies of Ancient Civilizations (4th grade) and American History (2nd grade). What a week! ... than Joseph and the Amazing Technicolor Dreamcoat by Andrew Lloyd Webber and Tim Rice performed this morning by our sixth grade boys? The musical didn’t stop moving from opening act to the final scene—breathtaking! Joseph's father, Jacob, played convincingly by Christopher V-R. favored Joseph and gave him a multicolored coat as a gift; as a result, Joseph, played handsomely by Patrick B. and Aidan S., was envied by his eleven brothers who saw the special coat as a sign that Joseph would assume leadership of the family. The rest of the story can be found in Genesis—the plotting of the brothers against Joseph, Reuben’s (played by Henry T.) interposition, the throwing of Joseph into the pit and the secret plan to rescue him later; the twist in Reuben’s absence, and the later discovery of Joseph in Egypt. I’m not sure if I’ll ever fully recover for the intense stress experienced by my abdominal muscles when “the King” or should I say Pharaoh, aka Felix S. burst onto stage after a perfect, suspense filled, lead in—the accent, the drama, the singing ... the moves! It was a masterful performance by the entire cast, especially the “unique and appealing” choreography by Maureen McCallister, our visiting professional. Who knew the boys could dance and move so fluidly, and with such purpose. Congratulations to all! The experiences of childhood, both positive and negative, create impressions that become deeply etched in our minds. This became evident, again, in listening to Francis today. Francis' recollections of his childhood experiences within the walls of Saint David's left a powerful and lasting impression on him--one, he said, that gave him his positive outlook on life. Childhood should be "a rainbow in the sky" for all children--the Child is father of the Man. Our children too teach us. We should listen. Two important themes were brilliantly explored by 7 Theta this morning in their interpretation of Sophocles’ play Philoctetes set in the ninth year of the Trojan war where Philoctetes is recalled to Troy from his exile on Lemnos. This tragic Greek drama examines the effects of disability and suffering in the wounded warrior and its effects on the social fabric. Philoctetes, the greatest of the Greek archers, played superbly by Christopher R., articulates in several of his monologues, the physical, psychological and social disruption caused by his suffering; what today we would call post traumatic stress disorder. Secondly, it explores how an essentially moral person, Neoptolemus, Achilles son, played with a commanding alertness by Tomaso R. is persuaded to engage in unethical behavior by a powerful superior, Odysseus, played confidently by Matthew McC.—and what then moves him to return to his new moral framework, enlarged by his almost complete betrayal of Philoctetes. I enjoyed the correlation that the boys drew in their narration of the play with the effects of war today and the post traumatic stress often experienced by returning soldiers from Afghanistan and Iraq. The PowerPoint presentation documented this correlation, giving the play a meaningful contemporary message. The boys also explored the stigma so often associated with illness and disability. Sophocles' intent to show the negative side of Odysseus’ shrewdness is what makes this play so interesting. Instead of seeing Odysseus as the hero (as in the Iliad and the Odyssey), we see him in Philoctetes as an opportunistic man who rationalizes his deceptions and abandonment of Philoctetes with a pragmatic argument—the moral core of the “hero” is missing. "Do the little things you have seen and heard me do." Although the patron saint of Wales whose day we celebrate today is not the patron of our school, we non-the-less, because of long tradition, celebrate his feast day every March 1st. Saint David, or Dewi Sant, as he is known in Welsh, was a very gentle person who lived a frugal life. It is said that he ate mostly bread and herbs and to have drank nothing but water. David was a Celtic monk and bishop, who lived in the sixth century. During his long life—it is said he lived to 100—he was the archbishop of Wales, helped the poor, established several monasteries, and spread Christianity throughout western Britain.